GoPro officially introduced three new action cameras – two new Hero4 cams and a new entry-level camera called just Hero. 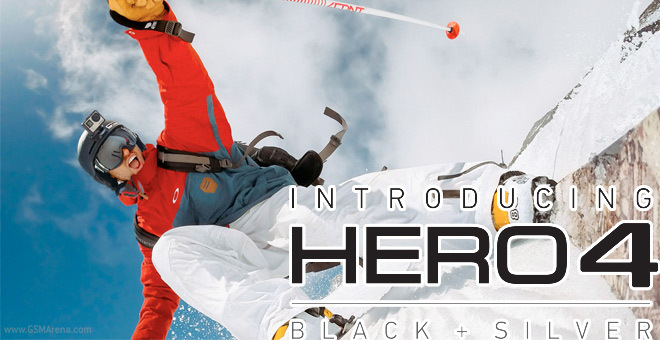 The Hero4 comes in high-end Black and mid-range Silver options but the difference between the two is bigger than in previous years – the Black records 2160p@30fps video, while the Silver doesn’t but is the first with a color touchscreen. All cameras record at least 1080p@30fps and can dive up to 40 meters (131 feet) underwater – far beyond what any IP-certified phone can manage (of course, you’ll need the waterproof housing for that). The Hero4 Black has a new image processor that promises improved image quality and 2x better performance, which of course means 2160p video at 30fps (the previous generation was capped at 15fps). Other resolution/framerate combos of note include 2.7K@50fps and 1080p@120fps. The camera can also capture 12MP photos in 30fps bursts. The GoPro Hero4 Black offers Protune for photos and videos – it helps professionals with advanced manual controls. The new audio capture system boasts twice the dynamic range of previous models and if that’s not enough there’s input for low-sensitivity external mics. There’s a new dedicated button that tries to make operating the camera easier but GoPros are small and never had the best UI. You can use the GoPro App for better convenience or the Smart Remote that has an impressive range of 180m (600 feet). The GoPro Hero4 Black will be available from October 5 and will cost $500/€480/£370. As I said, the GoPros are too tiny and only have small monochrome displays so the on-device controls aren’t all that great. The Hero4 Silver adds a color touchscreen on the back so you can preview photos and videos and easily navigate the camera’s menu’s without a smartphone (but the app and Smart Remote are still supported). The camera doesn’t have Black’s video prowess – it tops out at 2.7K@30fps, plus the high-framerate 1080p@60fps, 960p@100fps and 720p@120fps modes. You can shoot 2160p video though only at 15fps like the Hero3 Black from the previous generation. The GoPro Hero4 Silver also has double the dynamic range and an input for external mics. There’s also Protune for photos and videos and the camera can dive to 40 meters too. The touchscreen won’t work underwater though, so you’re back to relying on the hardware buttons. The Silver will also be available on October 5 and will cost $400/€380/£290. It saves you some cash and adds the convenient touchscreen for those who have more modest demands for resolution and framerate. The simple name signals a basic action camera – it can do standard 1080p@30fps and 720p@60fps videos and can dive just as deep as its pricier counterparts (40 meters), but costs considerably less. The GoPro Hero costs just $130/€125/£100, which is great for casual users who need a rugged camera but wouldn’t plug in external microphones or process the ultra-high definition footage in a professional editor. That’s right, the Hero lacks the new audio system, the external mic input and the pro-oriented video modes and settings, no app and remote control functionality either. Still, it costs a third what the Hero4 Silver goes for and less than a quarter of the flagship Black price, bringing GoPro’s rugged cameras to the masses (probably not what HTC want to hear with its event a week away).